Located on the waterfront overlooking the historic Balboa Ferry with a panoramic view of Newport Harbor, Balboa Island, Newport Center, and the distant peaks of Saddleback. 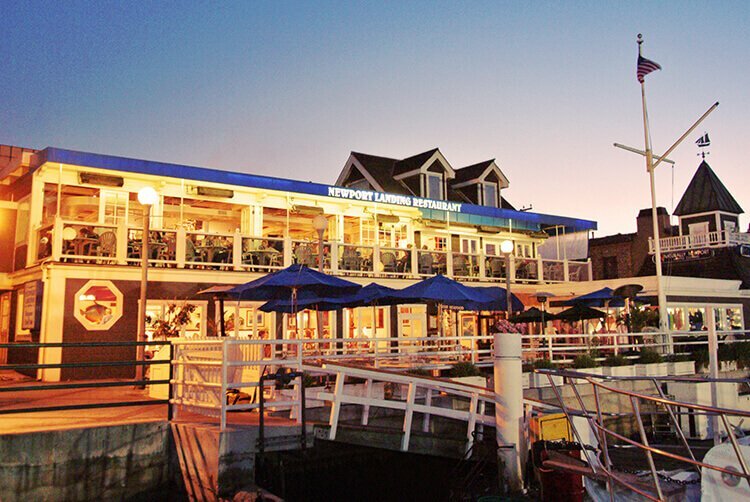 For over thirty years, Newport Landing Restaurant provides an award winning upscale casual atmosphere located on the harbor’s edge, with some of the best views of Newport Harbor from the upstairs Oyster Bar, the outside covered Lanai patio or one of its dining rooms. At Newport Landing we are dedicated to serving the freshest, and when possible, sustainable seafood available. We only serve fresh hand cut steaks and fresh ground hamburger, fresh natural steroid free chicken breasts, fresh breads delivered daily and fresh locally sourced produce. Local California wine list, craft beers and tropical drinks, along with the “Longest Happy Hour in Town” in our upstairs Oyster Bar.